The post Is It Possible to Recover Overwritten Files from the Hard Disk Drive? appeared first on OneTechStop. The magnetic domains on HDD invisible process and remove all stored data in the location. However, the residual physical traces with changes in magnetization of forces and similar technologies. In addition, the hard drive recovery data successfully through privacy. It is one of the best processes including the technical way known to the public that can restore overwritten data. Sometimes, the free software is available for each and every operating system to use of recover deleted files from your hard drive. Moreover, the setup of your files may exist with your backup. 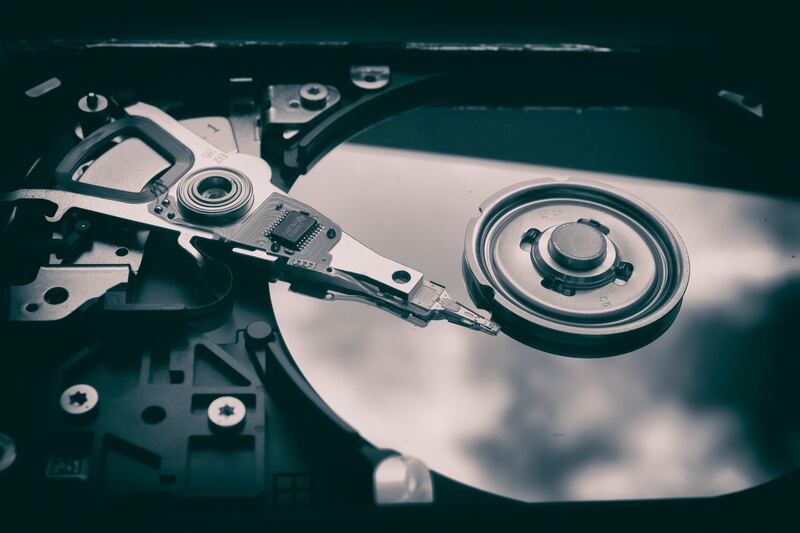 The overwritten magnetic domains on the hdd recovery process of physically remove information previously stored in the location. It also requires the use of a magnetic force microscope or similar technologies. For instance, there are different data and use lots of way to the public and restore the overwritten data. The recovered by data recovery software is considered overwritten the files. Of course, there are different data recovery tools and use the lots of techniques must be produced the different results. The complete format can perform the data recovery and also understand. In the main factor, the best and particular drive should be confirming the drive is empty. On another process, it is very safe and secures the random access of recovered the user data as well as the files are created filled with random data by the secure erase utility. First of all, recovering your files system and point of using the System Restore is very efficient to recover overwritten files on it. The restore previous version of excel file typically only the information stored the Computer file system and long to delete the actual file. In addition, the operating system can store the new files which consult the table and also available space. Moreover, the location of the deleted files should write new data over the old data and includes the delete data. 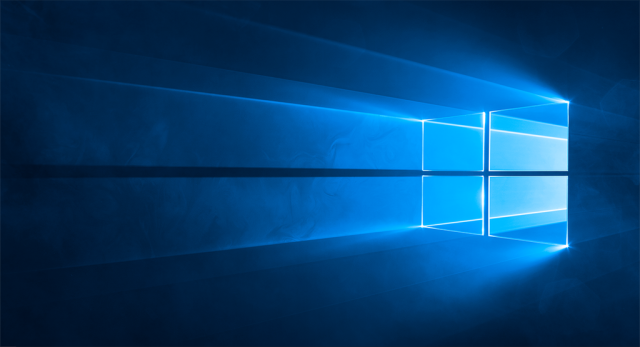 The post Windows Insider – Build 18342 Now Available for Slow Ring appeared first on OneTechStop. The post Windows Insider – Build 18312 Rolls Out to Fast Ring Insiders appeared first on OneTechStop. Microsoft is rolling out Build 18312 to Fast Ring Insiders. This builds includes several new features to check out, including improvements to the “Reset this PC” UI and the subsystem for Linux Command Line Tool. 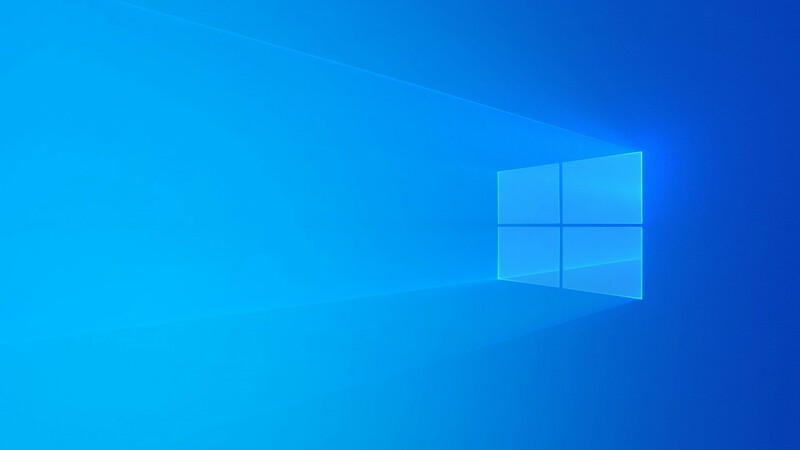 Reserving disk space to keep Windows 10 up to date: In 19H1, we’re making a few changes to how Windows 10 manages disk space. Through reserved storage, some disk space will be set aside to be used by updates, apps, temporary files, and system caches. Our goal is to improve the day-to-day function of your PC by ensuring critical OS functions always have access to disk space. With reserved storage, updates, apps, temporary files, and caches are less likely to take away from valuable free space and should continue to operate as expected. Reserved storage will be introduced automatically on PCs that come with 19H1 pre-installed or on PCs where 19H1 was clean installed. FLS Slot Limit Increase: As PCs get more powerful, musicians have created increasingly complex projects with more tracks, more instruments, and deeper effects chains. As a result, some of those musicians were running up against an FLS (Fiber Local Storage) slot allocation ceiling that prevented them from loading into their DAWs (Digital Audio Workstations) as many unique plugins as they’d like. This build greatly raises that per-process FLS slot allocation ceiling, allowing loading potentially thousands of unique plugins. Beyond musicians, this change will positively impact any application that dynamically loads hundreds or thousands of unique DLLs that have statically-linked Visual C++ runtimes, or otherwise allocates FLS slots. Reset this PC UI Improvements: We added new UI for Reset this PC as part of Settings > Update & Security > Recovery. The new UI provides a more consistent experience across devices with different configurations and requires fewer clicks to complete. 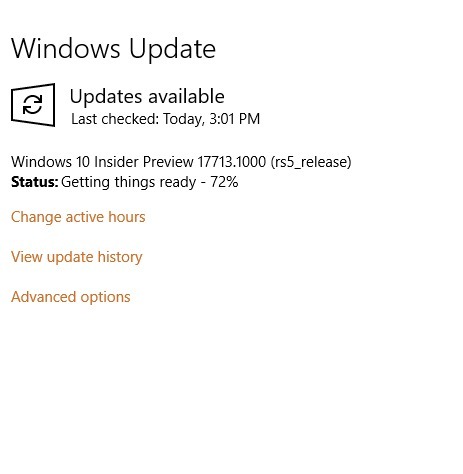 Fast Ring Insiders can update their PC now to install this build. To check out other General changes, improvements, and fixes, click here. 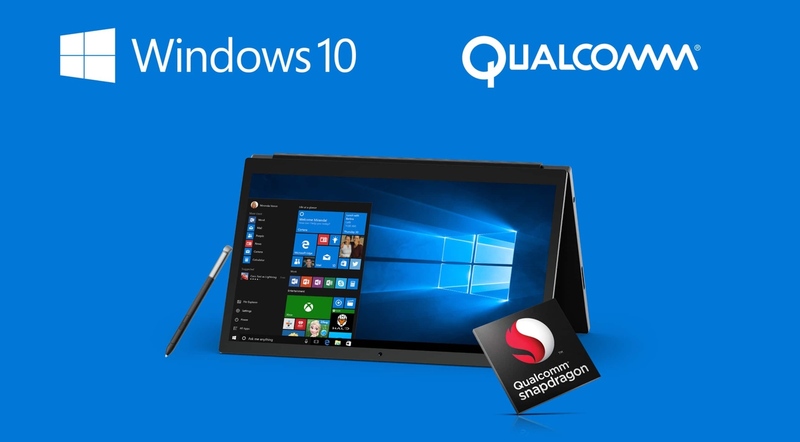 The post Microsoft is Allowing to Create Native 64-Bit Apps for Windows on ARM appeared first on OneTechStop. The post Snapchat’s new Snap Camera app brings the filters to your desktop appeared first on OneTechStop. Snap Camera on desktop allows for a variety of use cases. For example, users can apply a filter when they’re streaming themselves playing Fortnite or when they’re in a video calling with someone on Skype. In order to use the lenses on desktop, users have to install Snap Camera and then use it as the camera output in third-party apps like Twitch. The app will allow them to access countless Snap lenses created by the company itself and the community using the Lens Studio tool. Lenses can be searched for using keywords as well. “We’re trying to find new distribution channels for those creators to surface their work. We think this a very unique opportunity, bringing Snapchat AR experiences to the desktop,” said Pilipski. A full guide to using the new Snap Camera lenses is available online. Minimum system requirements include a PC or Mac with an Intel Core i3 processor clocked at least 2.5 GHz, or an AMD Phenom II clocked at 2.6Ghz, 4GB of RAM, and a screen resolution of 1,280 x 768 or higher. Considering that Snapchat has been struggling lately, and users have been opening the app less frequently, the new app could expand its base. As noted in August, 3 million people quit the platform, primarily due to its controversial redesign. 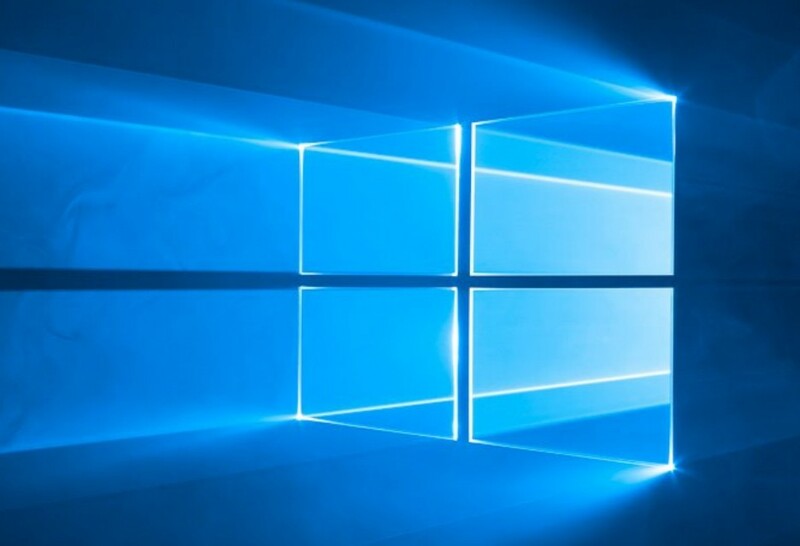 The post 4 Benefits of Using Windows for Your Business appeared first on OneTechStop. When you are running a business, you want to have everything running smoothly without any delays or problems with production. One way that you can achieve this is to use a computer system that will be reliable and adaptable to your needs. For many companies, they have been using an operating system like Windows for many years. Here are some of the benefits to using this popular OS. Windows 10, which is the company’s latest operating system, has been found to be the most secure that the company has produced. The previous OS has had many issues with security, mainly because of loopholes in the software that hackers were able to exploit. However, with Windows 10, the company has addressed these issues and even the worlds largest global ransomware attack WannaCry didn’t affect the OS. For this reason, many companies are starting to upgrade their previous windows versions to the new Windows 10. Companies have found that apart from the security features, they can also add their own layers of security without any issues. With software that you are using from other companies, there is always the risk that it won’t be compatible with your computer’s software. It can prove costly for your company, especially if you have to make changes to your systems to accommodate this new software. However, many companies use Windows because software developers create compatible software for it. In many cases, you can simply add the software to your existing systems without any adaptions or modifications. It means that you can use an affordable pcb design software or your company and it will work just as well as any other. Creators of operating systems want you to use theirs over anyone else’s, which is why they try to incorporate connectivity with other devices and software. Although older versions of Windows might not have been as successful at this as other operating systems, the newer versions have been much improved. With a lighter but still useful Windows version for mobile phones and tablets along with Windows software available as apps, it has made using the OS across devices easier. It also enables workers to share documents and collaborate easily, even when they are in different locations. Although people use their mobile phones and tablets a lot, many also have access to a laptop or PC at home. These are typically running Mac OS by Apple or Windows, though the majority of them are sold with Windows OS as standard. That means your employees will be used to using this software and know how it operates. It can be a big advantage in business because you won’t need to train your staff to use it except for any additional business components. Retraining staff to use new systems is not only expensive but also costly in time and resources. That is why it is best to use an operating system that can be tailored to your needs and is universally known. The post Windows 95 now comes out as an app for Windows 10 appeared first on OneTechStop. Long ago, Microsoft used to rule the market with its Windows lineup. And, Windows 95 used to a super hit OS in its time. After Windows 3.1, the first windows version with a GUI, although based on a command line running behind, Windows 95 took over the market. But now you will not get a new PC with this Windows version since it got extinct with time. You may get a hands-on the ISO file and boot it into a VMWare/VirtualBox, but no fresh installed PC with the same OS. Yes, you can clean install on your system, but it will not work as expected. Back in those days, hardware demand was very less than today. Even you will not get 64-Bit ISO for the Windows. But some crazy guy from Git managed to virtualize the OS and make an EXE out of the OS. 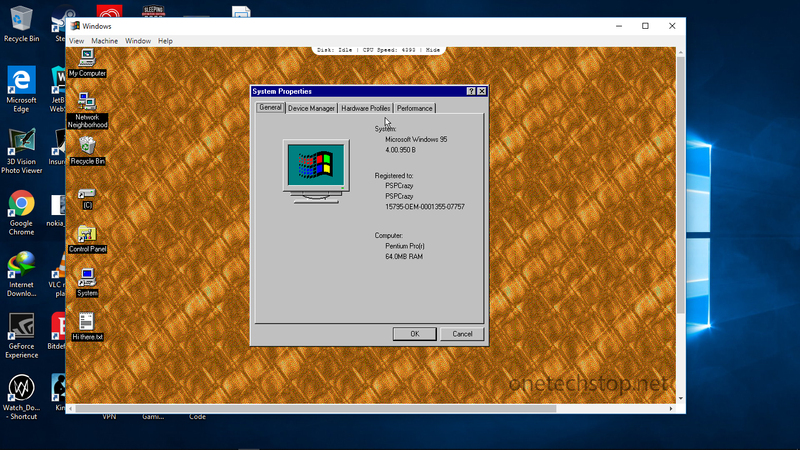 Yes, it’s now possible to run Windows 95 on your Windows 10 PC without even dual booting it. It is codename Chicago. It is the first OS from Microsoft to bring true GUI based OS. 95 also features what we call the Start Button, Taskbar etc. It also features plug n play back in those days. The OS remained in the market for three years after which it was succeeded by Windows 98. The post Windows Insider : Build 17723 and Build 18204 Now Available for Insiders In Fast and Skip Ahead Rings appeared first on OneTechStop. The post Windows Insider Build 17713 : Resetting Skip Ahead, Edge Improvements and more appeared first on OneTechStop. Microsoft pushed out another update for Windows Insider and this time, the company is resetting Skip Ahead’. That means if you have opted for Skip Ahead Builds while being an Insider, you’d be automatically put back into the Fast ring. • Per-site media autoplay controls: You can now control autoplay permissions on a per-site basis under the “Website permission” section of the Website Identification pane – just click the information icon or lock icon on the left side of the address bar and click “manage permissions” to get started. • Lookup definitions for words in Reading View, Books, and PDFs: We’ve added a new dictionary function, so you can look up definitions for key words when reading a page or document. Simply select a single word to see the definition appear above your selection. • You can choose to have a word read aloud to you to hear the correct pronunciation or expand more details from the definition. You can toggle whether definitions appear and which types of content they work in under the “General” tab of the Microsoft Edge settings menu. • Improved toolbar options: The toolbar available on a PDF document opened in Microsoft Edge will now show text descriptions for the icons to make them easily understandable. by the users. New options like “Add notes” are now available in the toolbar so that these tools are handy when you need them. • Pin/unpin PDF toolbar: The toolbar can now be pinned at the top of the document, making all the PDF tools easily accessible if you need them. You can also unpin the toolbar for an immersive reading experience. If the toolbar is unpinned, it will hide itself – just hover over the top area to bring it back. • Rendering improvements: We’ve included a bunch of rendering performance fixes with this build. Now you will see less and less of the white pages when you navigate through PDF files in Microsoft Edge. All these things should help when using a word to pdf converter. • With Build 17666, we introduced extended line ending support for Notepad. We’re excited to share that today’s build has a few more surprises in store based on what you’ve been telling us! • Wrap-around find/replace: We’ve made significant improvement to the find/replace experience in Notepad. We added the option to do wrap-around find/replace to the find dialog and Notepad will now remember previously entered values and the state of checkboxes and automatically populate them the next time you open the find dialog. Additionally, when you have text selected and open the find dialog we will automatically populate the search field with the selected text. • Text zooming: We’ve added options to make it quick and easy to zoom text in Notepad. There is a new menu option under View > Zoom to change the zoom level and we display the current zoom level in the status bar. You can also use Ctrl + Plus, Ctrl + Minus and Ctrl + MouseWheel to zoom in and out and use Ctrl + 0 to restore the zoom level to the default. • Line numbers with word-wrap: A long outstanding request has been to add the ability to display line and column numbers when word-wrap is enabled. This is now possible in Notepad and we’ve made the status bar visible by default. You can still turn the status bar off in the View menu. • We’ve improved the performance when opening large files in Notepad. • Notepad now supports Ctrl + Backspace to delete the previous word. • Arrow keys now correctly unselect text first and then move the cursor. • When saving a file in Notepad, the line and column number no longer reset to 1. • Notepad now correctly displays lines that don’t fit entirely on the screen. Don’t forget the checkout the full official change log (click here) for Windows Insider Build 17713. 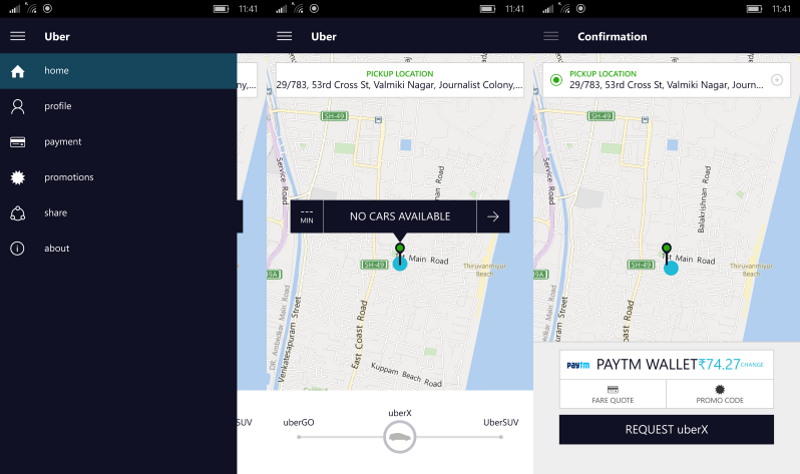 The post Uber ceases support for its official app on Windows 10 appeared first on OneTechStop.